Z.Tactical MSA Sordin's slim cup and headband design allows the headset to be worn under ballistic helmets. The digital electronic design of the zSordin is controlled by a micro-processor. This makes it possible to combine very low current consumption with high performance. Electronics will instantaneously suppress harmful impact noises to 82 dBA inside the earcups, while amplifying up to 18 dB ambient noises/voices. 1 AAA battery in each cup, 270 hrs battery life, waterproof battery cover design. Military standard version NATO plug. Perfect for outdoor gaming activities. Three buttons(two volume buttons, and one on / off button). PTT (push to talk) unit and batteries are not included. Make sure the battery installed correctly(positive and negative ), or the sound pickup function will Unable work! This headset is used with PTT (push to talk), can not be connected with mobile phone, MP3, computer. If you are unsatisfied or if there is a malfunction, just contact us and we'll give you a free exchange or return it for your money back. Order Risk Free Now! High Quality - camo headband and sand color cups; slim earcup design and soft ear cushions for all-day comfort; headband can be pushed up an down to adjust to ensure one size fit most. Sound Reproduction - amplify and reproduce low-level sound,even if it's very weak with near-perfect sound reproduction(need to install two AAA batteries). you can clearly hearing radio communication even in an extreme conditions. Noise Prevention - instantaneously suppress harmful impact noise to 82dB inside the earcups to protect your hearing, and continue to pick up if noise disappear. 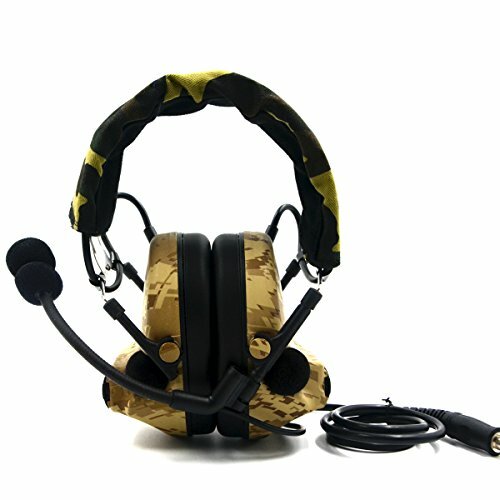 Effective Communication - this headset is used with PTT (push to talk), can not be connected to two-way redio, mobile phone, MP3, computer etc. the plug is military standard version NATO plug. Multiple Uses - Ideal for a wide variety of applications, including gun ranges; hunting; shooting; target practice;fork lift drivers; airport ground personnel; maintenance mechanics; and industrial workers. If you have any questions about this product by Dolphin, contact us by completing and submitting the form below. If you are looking for a specif part number, please include it with your message. Walker's Ultimate Alpha Power Muff Electronic Earmuffs (NRR 26dB) Flat Dark.